It’s easy to forget that so many nurses don’t actually work in a hospital, clinic or school. Nursing is the kind of career that can really take you in several different directions. Case in point? Rose Church, famous for being NASA’s first nurse. But that’s not the only reason we love her–we’re also impressed by how she landed the gig! An employee of McDonnell Douglas in St. Louis, Mo., Church had heard that the company was hiring an “aerospace physician.” Interested in the gig, she created an opportunity to speak with president James McDonnell and told him, “Where there’s a doctor, there’s always a nurse.” And after that conversation, she was that nurse! 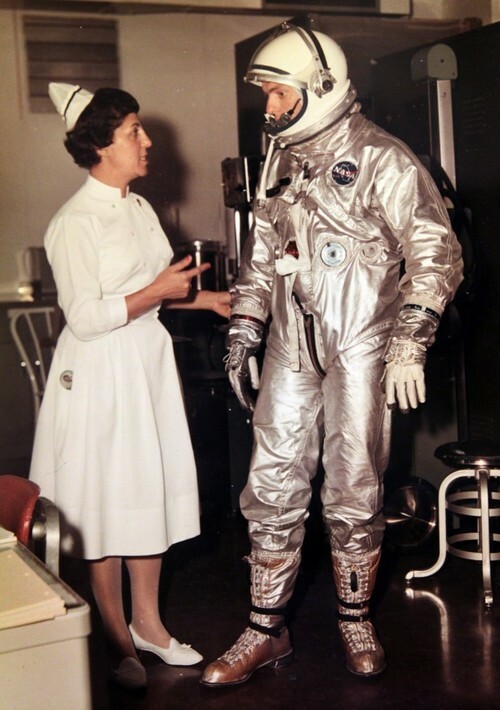 Church went on to serve as the nurse to the Mercury and Gemini astronauts, including John Glenn, Alan Shepard and Gus Grissom. She is remembered as having a smart, quick wit and being super sweet–she would often bring astronauts their favorite training snack, even if it was a doughnut or a beer. Ha! Church passed away late last year, but her spirit and hard work will always be remembered.